NA Chairwoman Nguyen Thi Kim Ngan attended the 140th Assembly of the Inter-Parliamentary Union (IPU -140) and related meetings in Doha, Qatar, at the invitation of IPU President Gabriela Cuevas Barron and Chairman of the Consultative Assembly of Qatar Ahmad Bin Abdullah Al Mahmoud. The Vietnamese NA leader made the statement while addressing the plenary session of the IPU-140, stressing that Vietnam is always a responsible member of the IPU and is ready to work with IPU and other member parliaments to implement the IPU resolutions and initiatives, contributing to building peace and sustainable development for the sake of people around the world. On the sidelines of the IPU-140, she met with Prime Minister of Qatar Abdullah bin Nasser bin Khalifa Al Thani as well as delegations from participating countries, including Russia, the Federated States of Micronesia, China, Georgia and Sri Lanka. On the occasion, NA Chairwoman Ngan visited the Vietnamese Embassy in Doha and representatives from the Vietnamese community in Qatar. 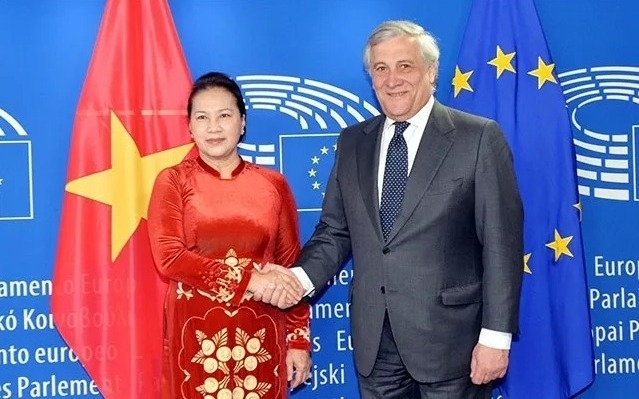 Chairwoman of Vietnamese National Assembly (NA) Nguyen Thi Kim Ngan paid her official visit to France and the European Parliament (EP) in the capital city of Brussels, Belgium. During her visit to France, she held talks with President of the National Assembly of France Richard Farrand and received National Secretary of the French Communist Party (PCF) Fabien Rousse as well as met with French Prime Minister Edouard Philippe and President of the Senate of France Gerand Larcher. During her stay in Belgium, NA Chairwoman Ngan held talks with President of the European Parliament (EP) Antonio Tajani as well as received President of the Chamber of Representatives of Belgium Siegfried Bracke. She also met with Chairman of the European Parliament (EP)’s Committee on International Trade (INTA) Bernd Lange, President of the Belgian Senate Jacques Brotchi, President of the European Commission Jean-Claude Juncker, and Minister-President of Wallonia region Willy Borsus. Prime Minister Nguyen Xuan Phuc chaired the Government’s regular meeting in Hanoi on April 2, to assess the socio-economic situation in March and the first quarter of the year. At the meeting, the Government leader asked the agencies and localities to implement urgent measures to promote socio-economic development as well as to handle pressing social issues. Prime Minister Nguyen Xuan Phuc shared the joy of the traditional Chol Chnam Thmay (New Year) festival with Khmer ethnic people as well as Theravada Buddhist dignitaries and followers in Can Tho city and Soc Trang province. Other leaders, including Deputy PM Truong Hoa Binh and President of Vietnam Fatherland Front Tran Thanh Man, also congratulated the Khmer people on their traditional New Year festival. Earlier, the PM sent a message of greetings to the Khmer ethnic people on the occasion of their traditional Chol Chnam Thmay (New Year) festival. The total state budget revenue reached VND381 trillion (over US$16.4 billion) in the first quarter of this year, up 13.2% over the same period last year. Specifically, domestic revenue hit VND315.4 trillion, up 13.8% year-on-year and equivalent to 26.9% of the full-year target. The Vietnamese Traditional Culture Festival and International Cultural Exchange is taking place at the Thang Long Imperial Citadel in Hanoi from April 5-9. The event features numerous performance of folk music as well as reproductions of the space of Vietnamese villages and traditional rituals, among other unique cultural activities. Vietnam maintained leadership of Group B in the second round of the 2020 AFC Women’s Olympic Qualifying Tournament after easing past Hong Kong (China) 2-1. Mai Duc Chung’s side had three points ahead of Uzbekistan. Meanwhile, Hong Kong (China) and Jordan follow in third and fourth place, respectively, level on only one point. Vietnam will only have to manage a draw against Jordan in the last encounter, on April 9, to enter the third round of the 2020 Women’s Olympic AFC qualifiers. 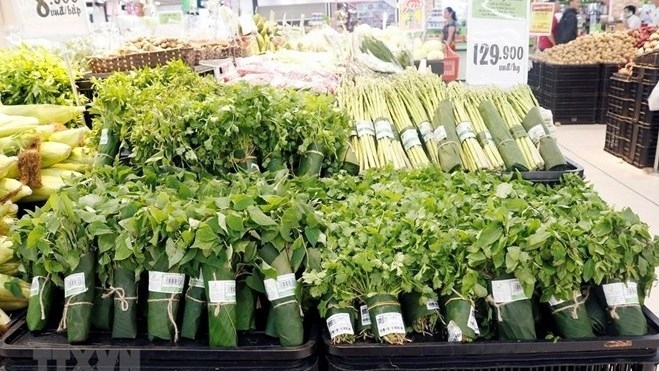 Several supermarkets in Vietnam have begun wrapping their products with natural alternatives, contributing to raising public awareness of protecting the environment. Prime Minister Nguyen Xuan Phuc sent his letter to praise these supermarkets, calling on the business community, supermarkets, restaurants and hotels to join in the efforts to reduce plastic bags and waste.